You'll be able to get your hands on a new car as well. When we reviewed Gameloft's Asphalt 8: Airborne a couple of months back, we found it to be a terrific racing experience. While not as in-depth as Real Racing 3 or 2K Drive, it has a lot to offer, especially to arcade racing fans. If you had any hesitation about buying the game, you can consider that gone now, as Gameloft officially made it a free-to-play title. The game features a number of tracks and cars that you can try for no charge, along with downloadable content that you can fork over a few bucks for - completely optional of course. In addition, Gameloft released an update for the game that introduces a new vehicle, the Clio R.S., as well as a racing event where players compete to win a real one for themselves. More details are available in the app. 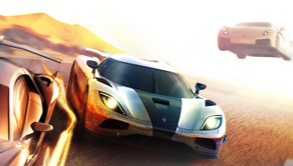 Asphalt 8's news couldn't come at a better time, as Gameloft recently reported a huge third quarter sales period of $83.5 million, with free-to-play games accounting for 55 percent of its sales. No doubt Airborne will add to that number leading into the holiday season.